Exciting news! Being the largest color launch to-date, DuPont™ Corian® Design has recently introduced 5 new aesthetics (Aggregate, Terrazzo, Linear, Nuwood and Onyx aesthetics) to Corian® Solid Surface. This unmatched collection of bold colors and patterns allows for endless possibilities in both interior and exterior spaces. As of April 1, 2019, these 15 new colors are available. Whether you’re a consumer, designer, architect, or home builder, the 2019 launch of Corian® Solid Surface will leave you inspired, and others awe-struck. Created to make a truly one-of-a-kind space, let’s learn more about these 6 new collections of Corian® Solid Surface. The team at Corian® Design has developed these new collections with the intention of being trend-forward and to offer as many different design possibilities as possible. Are you ready to become inspired? 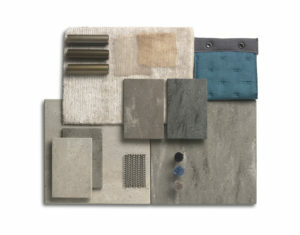 Aggregate Collection: Encompassing four new colors, this collection showcases the use of an industrial look. Neutral Aggregate, Ash Aggregate, Weathered Aggregate, and Carbon Aggregate express the modern and timeless look of Corian® Solid Surface while being able to transition between different design styles and applications. Terrazzo Collection: These three new colors are the perfect combination of classic and angular. 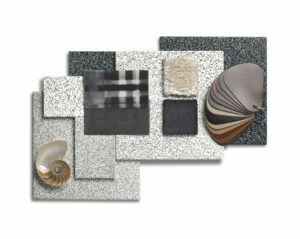 Featuring whites, grays, and blacks, these colors were inspired by mid century design. Teasing, calming, and contrasting – with either Domino Terrazzo, Pebble Terrazzo, or Basalt Terrazzo, you’ll be able to find a dramatic, dimensional, and stylish look for any space. Linear Collection: Where parallel lines meet, two calming and cooling colors form this collection. 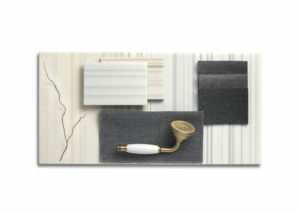 With both Silver Linear and Sepia Linear, variegated lines of each color streak through a pure white base. Sharp, modern, and defining what parallel veining should look like, these linear colors can be created with uninterrupted lines or staggered for a staccato effect. Nuwood Collection: Showcasing one of the earth’s most gorgeous natural resources, wood, this collection allows you to create a space in a whole new way. 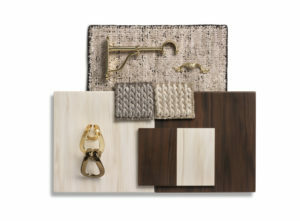 From rich Mahogany Nuwood to the sun washed Beech Nuwood, with this collection, you can let your imagination run wild. Onyx Collection: Bold. Unique. Colorful. The swirls of green or gold emulate energy and beauty. Able to be illuminated from either below or above, the two colors in this Onyx collection (Jade Onyx and Golden Onyx) help to create a multi-layered classic and unique look. 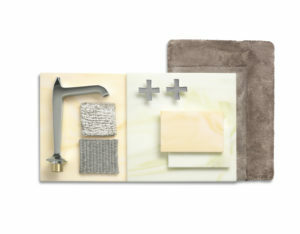 Solid Collection: Vibrant and rich, the two colors (Verdant and Laguna) make a bold, clean, and harmonizing statement. 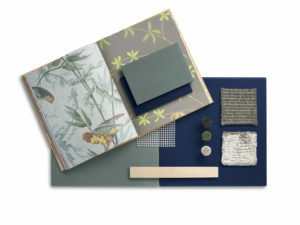 Celebrating a new direction for blues and greens, these two new solid colors are perfect for both residential and commercial applications both inside and out. For more information about these new colors of Corian® Solid Surface, please visit http://www.coriandesign.com. This surfacing material was the only solid countertop surface material on the market before Formica, Staron, and Wilsonart. But this material is so much more. It’s durable, tough, easy-to-clean, nonporous, repairable, and seamless. In fact, this surfacing material gives any space the freedom of expression. The possibilities are truly endless. Here at H.J. Oldenkamp Company, we’ve been distributing Corian® Solid Surface since 1971. Currently, we distribute for all or portions of Michigan, Alabama, Florida, Kentucky, Mississippi, and Tennessee. For questions or to request samples or literature, please contact our team today.